I care! What kind of new things will you be learning? Ooooh, I’m so excited for you! What will you be doing in road safety that is different from what you do now? heury and I want to know! Yes but I return from holiday on the 18th so not before then. Details on job I'm not sure about. Looking at data and doing crash investigations. On phone so not going to speculate at length. Frustrating situation. I could have emphasized how confident my read was but I really didn't seriously consider that scum would kill me. Oh well, karmic payback for locking Madge in a room with a bomb that one time. Laserguy will be lynched today, and 50/50 if Madge trusts my read or her gut on the final day. It'd be good sportsmanship if the Mafia killed Madge instead of wam, but I can respect that that isn't the ideal move. For some reason BoomFrog wasn’t leading town like he should have been. You can't see the ripples if you are making waves. Also, I thought JimBob was confirmed town. It was a test of laserguy and mpolo. Edit: Realized the timing was probably about the Mark lynch. I wasn't super against it so I didn't push, it was sound strategy if he was going to be modkilled, and a modkill was pretty likely. In the end it did give me info about LaserGuy. BoomFrog, what SDK said here. You are correct, the comment was about the mark vs moody lynch, because the votes for moody were there, but there was no one rallying them. I’m not sure why anyone thought Mark would be modkilled. He never requested a replacement, jimbob’s modprod request was just short of the usual 48 hours of inactivity (which may have given people the impression that he was gone longer than he actually was), and Mark responded to the mod prod. So Gojoe thread, things have slowed down, so I guess it’s up to me to entertain the spectators. As a player, D3-D4 is usually when I start really struggling, and I start making Gojoe posts about how I’ve hit the wall, how I’m dry for content, etc. Interestingly, the same thing has happened in this game. I’m struggling to write some interesting flavor, and not just a group of people sitting around arguing about mafia. I’m trying to write player meta appropriate dialogue, and that’s getting tougher too. Also I have finally accepted that I can’t get too far ahead in my writing. I was working on D4 end / D5 start concurrently, and had it all planned out for wam, and then had to rethink it all for BoomFrog. I also had something thought out for D6 with BoomFrog (something that won’t work as well with someone else), but alas, it is not to be. I have no idea how I’m going to end this. Right now I’m just hopeful something will come to me. Something better than Diemo’s house exploding. I am determined to be up to the challenge! I would love to know what you are all chatting about (no I'm not volunteering to get myself killed just to satisfy this urge). No doubt you are trying to send subliminal messages to wam and Madge. Except for bessie, who is probably just going "woof" a lot. Come on moody! Let's have some support from you! jimbobwoof wrote: I would love to know what you are all chatting about (no I'm not volunteering to get myself killed just to satisfy this urge). No doubt you are trying to send subliminal messages to wam and Madge. jimbobwoof wrote: Except for bessie, who is probably just going "woof" a lot. Before I forget, I'm simply loving the flavor, there's so much effort and goodwill behind it it's amazing. @jimbob im going to be away 21-28 July with limited internet. Is that going to cause issues with wot? Happy to be a replacement instead. wam wrote: @jimbob im going to be away 21-28 July with limited internet. Is that going to cause issues with wot? Happy to be a replacement instead. Personally, given it looks like we're struggling with numbers, I'd prefer you did what you could for the one game day, or possibly two half game days this will cover, but it's up to you. On that note, I'd really like a couple more players at least! Also, some people haven't sent me their sign-up PM yet... As an FYI, it will probably take 1-2 weeks for me to get around to starting the game once Meta Mafia is finished. Game length will obviously depend on numbers of players. Come on Madge, believe in my awesomeness! @JimBob: I wouldn't push people to join who are on the fence, we will inevitably need a replacement at some point so better not to dry the well early. I'd love to join (Although I am flavor blind), however my last day here at work is the 20th, and I'll be running around like a chicken with my head cut off until that time, and then I'll be away for a week or so on a decompression holiday in the wilderness. I'm willing to be a replacement when I return! @jimbob will leave my name as a player theb! I owe you my pyp bits as well. Congrats to scum! I will have my revenge next game though, too bad jimbob's modding it and won't play. GG. Not going to spoil it until Diemo or bessie post the closing flavour though. Have I got this wrong... will see my reads this game have been so wrong. GG Scum. Thought it would last another day at least, but seems that scum played too good of a game. Appropriately enough, that sort of thing happened to Amy all the time. You can't leave us hanging like this! PS if it is a power outage im sorry! wam wrote: You can't leave us hanging like this! I'm sorry wam. Technical difficulties. I'm getting it done now. Also I want to run a game again. One with lots of power roles and cool flavour. Any requests or volunteer comods? I have been really into handmaids tale along with everyone else in the universe but I think my style would not suit that flavour. Also if DJ is really gone forever, what will we do about Halloween this year? I could do a Brooklyn 99 Halloween Heist theme and at the rate games are going the timing might be right. But I also don't know if I am worthy of taking on that mantle, but then again, who is? jimbobmacdoodle wrote: On that note, I'd really like a couple more players at least! jimbobmacdoodle, what is the complexity level? Should we encourage new players to sign up for your game? Related question, would you allow mentoring (if we even have any available)? freezeblade wrote: I'd love to join (Although I am flavor blind), however my last day here at work is the 20th, and I'll be running around like a chicken with my head cut off until that time, and then I'll be away for a week or so on a decompression holiday in the wilderness. I'm willing to be a replacement when I return! Thanks, freezeblade. And I believe many of us are flavor blind as well. Flavor knowledge didn’t necessarily help in the last game, most of the players with flavor knowledge were the first to die. Have a great vacation! Madge wrote: Also if DJ is really gone forever, what will we do about Halloween this year? I could do a Brooklyn 99 Halloween Heist theme and at the rate games are going the timing might be right. But I also don't know if I am worthy of taking on that mantle, but then again, who is? Madge, put the Halloween game in the queue. If Djehutynakht comes back, then we will already have a place reserved for him. If not, then you can run it. While no one else can ever match what DJ did with the Halloween games, I believe you to be a worthy successor. flicky1991 wrote: Ooh... I know I don't really play any more but this is one of my favourite shows.. The game is going to be PR heavy (likely an ability for every player), and each player will have a secondary win condition. I haven't really decided on additional complexities beyond that yet, but the secondary win conditions may not be completely newbie friendly. Mentoring would be allowed though for anybody who wants it, if any mentors are available and willing, who would otherwise not be able to/want to play in the game. yup! I just read the last page cauze i heard it ended. Congrats on lasting that long mpolo. I will put halloween in the queue. I'm going to need a balance mod though since I want to come up with creative roles like sabrar helped me with last year but I don't believe that I can assess balance well. I'm on holiday next week but it won't stop me. Was bored and was running a few numbers on setups that I thought I'd like to share that are kind of interesting. Scum has won 5 out of the last 6 games, with the only loss being Alien Warfare which... mmm... maybe shouldn't count. 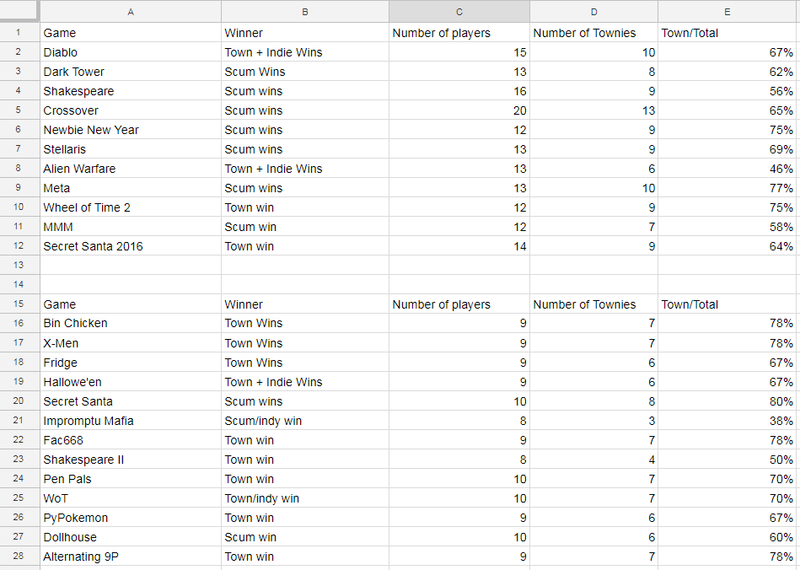 It's interesting to break this down by size: In games with 12 or more players, scum has won 6 of 8 (including Alien), whereas in games with 11 or fewer players, Town has won 4 of 5. In fact, if we go back all the way to Secret Santa 2016 (assuming I've counted everything correctly) and separate by player number, Town has won 10/13 on games of 10 or fewer players, but only 4/11 on games with 11 or more players. For whatever reason, it seems that larger games tend to be fairly heavily scumsided, and smaller games tend to be townsided. It may be worthwhile for mods to consider giving Town a bit more of an edge in larger setups... either adding another mislynch/removing indies (10-3 instead of 9-3-1 or similar), reducing PR strength of scum (roleblocker/rolecop/godfather is probably too strong in a 9-3 setup even against a fairly high-powered Town), or making more liberal use of mafia weakening roles like traitors. On the flip side, in smaller setups, Town could probably get by with a bit less power... either more VTs, avoiding cops/masons, etc. Looks like that having 3 full scum (so not Fridge) is a really important breakpoint. Also, it's hard to just buff town by adding mislynches, as their utility rapidly drops off as the game keeps increasing in size. Interesting numbers. I'd say impromptu Mafia shouldn't be in the list of "normal" games since it wasn't intended to be balanced from what I remember. Vicarin wrote: Looks like that having 3 full scum (so not Fridge) is a really important breakpoint. Also, it's hard to just buff town by adding mislynches, as their utility rapidly drops off as the game keeps increasing in size. Well having more mislynches means more opportunities for night results and stuff. Just being able to extend the game a couple extra day phases is good for Town. Oh, sure, it does help. It's just that each mislynch opportunity benefits the town less and less as there's more players, and unless there's a really strong town power that needs some time to get going, increasing the number of mislynches available won't do much if there's around 15 players. Madge wrote: I'm going to need a balance mod though since I want to come up with creative roles like sabrar helped me with last year but I don't believe that I can assess balance well. If needed, when the time comes we will [find you a volunteer/force a non-player into service] as required. I’m disappointed too. I remember your first post in the mafia forum very well. You don’t know how much that post, from someone I didn’t even know and that I couldn’t yet read, encouraged me to continue when I was so miserably struggling. And plytho, let us know when you're back. We hopefully won't need a replacement, but unfortunately RL issues happen. Sabrar wrote: I'm on holiday next week but it won't stop me. I don’t even.......Well yeah. We know you're playing. I can’t imagine anything that could keep you from playing after 36 days (and counting). I’m going to feel so bad after you struggle through D1 on your vacation, arrive home all ready to go full throttle on D2, and LaserGuy and I night kill you on N1. LaserGuy, I’m thinking about your post and will try to have some comments tomorrow.